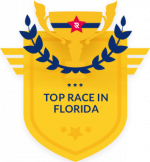 There’s so much to get pumped for – a beautiful course going over the Memorial Causeway, Sand Key, and Belleair Bridge; an awesome swag bag, a fun post-race party, and more! Plus, it’s all for a great cause! What more could you want in a race? Whether you have a connection to Clearwater For Youth or the running community, there are a number of great reasons to sponsor the 3 Bridge Race. We offer several sponsorship packages that all come with amazing perks! Watch Our Beautiful Race Route Captured LIVE! The inaugural Phil Doganiero 3 Bridge Half Marathon, 5K, and 1-mile fun walk took place on Saturday, November 11, 2017 at Coachman Park, Clearwater Florida, which brought out 1,011 runners and walkers in the community. The proceeds from the race will help further the Clearwater For Youth mission that no child will be denied the ability to play in a sports program because of financial concerns. We hope you continue to run with us in the future and the many years to come out of the 3 Bridge Race! Set your calendars for October 26, 2019, for our 3rd annual race. Mark our words, this will become a cornerstone event and one of the biggest races in the Southeastern United States!